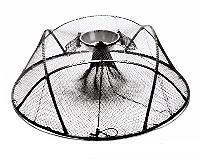 Has a 92cm, (37") diameter bottom drawstring opening (similar to purse nets), 23cm, (9") diameter polyethylene core opening or top, 15mm, (5/8") diamond braided knotless netting includes two monofilament bait bags attached to the top, vinyl covered high tensile steel bottom frame, and FRP (fiberglass) 15mm, (5/8") x 7mm, (5/16") support frame. Interstackable for easy storage or transport. Check with local marine regulatory agencies on legality of certain traps. 107cm diameter x 37cm high, (43" diameter x 15" high). The stackable nature of this trap is a very popular feature because it allows fishermen to carry many more traps per outing. Adding to higher catch ability and the safety factor due to less bulk on deck. Can be used by both hobby and commercial fishermen as well as by the scientific and government sectors. With careful handling and placement, a long life and great fishing ability can be expected from these traps. The traps are also cost and labour efficient.